The Italian niche perfume company Mazzolari also owns perfume shops in Italy that sell other brands (so don't be confused if you log onto their site and see lots of non-Mazzolari products listed). Mazzolari supposedly began as a barbershop in the late 1880s and became a perfume shop chain in the 1960s. Mazzolari's own perfumes debuted in the early 1990s. Vetiver is the first Mazzolari perfume I've smelled, but Now Smell This reviewed other Mazzolari perfumes back in 2006: Alessandro, Patchouly and Zagara. I chose to start my Mazzolari journey with Vetiver,* since vetiver is one of my favorite fragrance notes. Mazzolari Vetiver starts with a mossy, slightly indolic floral-citrus accord, creamy/sweet and cheerful. (Summer flashed before my eyes.) Slowly, a pungent vetiver emerges; the vetiver has 'heft' and presence at first, but then becomes soft and mellow. There's an interesting musk present, too; it's semi-dirty (think hairy musk after a rain-y rinse). The base of Vetiver is interesting — a mixture of vetiver, hay, musk and sandalwood (smelling of coconut and fresh bread). Though vetiver, the ingredient, is smack dab in the center of Vetiver, the perfume, this is not a solo-note fragrance (a 'caution' for those who want a pure/purer vetiver experience). Vetiver smells like perfume; though it's an Eau de Toilette, it has a depth and presence and multi-tiered development vintage fragrances possess. Vetiver immediately went on my summer to-buy list (yes, my to-buy list is so extensive now it's divided into seasons)! And I have to decide fast on the summer candidates — I always buy my summer perfumes when the weather is still temperate, before my mailbox becomes a perfume-destroying furnace. Mazzolari Vetiver starts with a too-sweet, floral-citrus-creamy cosmetic accord (the citrus is flat). Quickly, vetiver emerges but is almost immediately swallowed up by musk that smells like burning hair. The base of Vetiver mixes weak vetiver with sour/bitter notes (think rhubarb or red currant), more synthetic musk and "wood." Vetiver smells discount perfume-y — a wallop of inexpensive-smelling notes crisscrossing some vetiver. On a masculine-feminine scale of "1" being Caveman and "10" being Marilyn Monroe, Vetiver is a 7. I wanted to scrub Vetiver from my body. Have you ever had such an experience? Light application = Bliss; heavy application = Is This the Same Perfume? If so, share! Launching soon: Mazzolari Nero Vetiver (Black Vetiver). I'll try it, but my expectations are low. 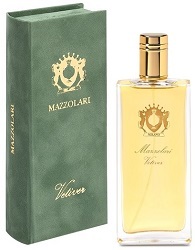 Mazzolari Vetiver Eau de Toilette is $150 for 100 ml. For buying information, see the listing for Mazzolari under Perfume Houses. *Listed fragrance notes of: lemon, orange, bergamot, nutmeg, vetiver, tobacco, sandalwood. Yes! Cue Joan Crawford No More Dabber Samples! I often wonder what method people use when sampling something new, as I tend to do a dab and then stick my nose right in. Well, that works to an extent, but it certainly doesn’t give me an accurate impression of what the fragrance smells like in real life unless it’s formulated for dabbing as in extraits. Even then, I feel that the ambient experience is very different from the nose-to-arm snuffling experience. I’m really glad that you brought this up! My current method is to only buy spray samples, or dabbers that I transfer into sprays. If I do have a dabber floating in The Sample Sea that drifts ashore and grabs my attention, my next move is to get a small spray decant. Honestly, for the money I’ve spent on samples over the years, I could have flown to NY or Paris, stayed in a decent hotel and gone spritzing. But Kevin, the question is…what do you think of your experience? Would you buy Mazzolari Vetiver to dab, or would you rely upon your impressions of it when sprayed? Holly, I am not a dab-and-sniff man in life…I Spraaaaaaay. I also buy a ton of small, cheap spray vials to transfer non-spray samples into. I have no interest in buying Vetiver now. Yes. Current Vent Vert. Felt hardly for the sample, got a bottle which eded up being quite expenive in my country and yikes! Liberally sprayed it smells so flat and synthetic. One single spray still has that alfresco Jolie Madame vibe, but now it’s kind of ruined for me. Your scale should be part of the metric system. ended. I need glasses, sorry. Solanace , the harsh elements of a fragrance are amplified when applied in quantity…I always apply a scent lavishly before buying. I am impressed by that level of commitment. I think that a lot of fragrances that I love would be too much at that volume and wonder if others would finally feel strong enough. … off to test it! gville: I feel seven is “just right” … ha! I used to apply much more…10…15?? I think I got into that mode because many of my earliest fragrance loves as a teen were Eaux de Cologne…so I had to spray and spray and spray. Anyway, I feel I must spray 6-7 times to get a real sense of a fragrance’s character. After that I apply according to power/sillage. Tell me how your testing goes! I spray most things 6-8 times so that doesn’t sound excessive. I hated SL Cuir Mauresque for years until I tried it dabbed instead of sprayed. At low intensity I could finally appreciate it. Cazaubon, that’s how I was with SL MKK…but now I spray it 2 times. John, I guess we should all experiment with application methods. I’ve had a few scents I could not abide on my person, but I loved them sprayed onto cotton balls I would tuck in my bag or car or a closet…on a bookshelf! Yes! The original Marni. I loved it from a dabbed sample and did not like it at all sprayed! I decant all samples into little sprayers because of this experience. stinkerk: though the bottles wouldn’t be as nice, I would even like my extraits to be sprays! Still waiting patiently for your musk-centric review. I know you have sampled broadly in this area, and many of us would love some of the topography sketched out. Your mention of MKK reminded me. I don’t understand what the guy at Smell Bent means by “vegetal musk,” even though I own a few of his fragrances. A thumbnail sketch-type roadmap would be a great place to start this journey. I particularly like ones that put me in mind of potent gym-grade underarm.